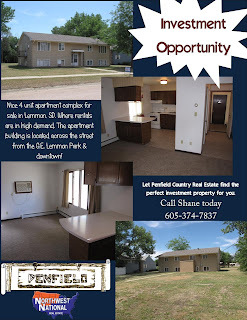 Nice four unit apartment complex for sale in Lemmon, South Dakota. The apartment building is located across the street from the G.E. Lemmon Park and downtown! Three units have two bedrooms and one has one bedroom. The carpet has been replaced in most of the apartments and newer appliances make for top-notch apartment living. The split level building allows for two apartments upstairs and two in the half basement. The upstairs apartments have balconies that add to the rent-ability of these units. The building also has a coin operated washer and dryer for tenants to use. Property is just a drive away from Shadehill Reservoir and Flat Creek Lake. Lemmon has limited rental units available and this building is the first stop for tenants looking for convenience and amenities. Each unit commands premium rent and with the recent improvements a new owner can watch their investment collect dividends. Call Shane Penfield, for more information or for a showing at 605-374-7837. Priced at $170,000.